A general broad-spectrum disinfectant for the treatment of disease-causing bacteria, fungus and parasites. Contains a double slime coat to aid fish in promoting natural body protection against infection. Can be used consistently as a preventative. Does not kill off necessary nitrifying bacteria in pond filters. Treats 1000 gallons per 16.5 oz. 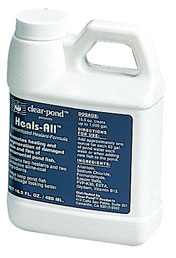 Heals All promotes healing through a double healant additive and an extra large dose of vitamin B12. It promotes the regeneration of damaged skin, fins or scales by mixing healing and protective coatings. Especially helpful with long fin (butterfly)Koi and fancy goldfish. The double slime coat protection promotes natural body protection against infection. Protects fish against secondary bacterial infection. Will not cause discoloration or cloudy water conditions. 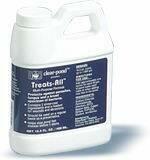 Treats 1000 gallons per 16.5 oz.